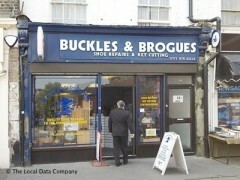 About: Buckles & Brogues provide a shoe repair and key cutting service. They also offer engraving and a locksmith service, with an extensive range of keys over 4000, including a very large range of security keys. Excellent shop always pleasant service, I would not use another shop for my shoe repairs as Buckles and Brogues offer the best service in this area. I've taken a couple of pairs of good quality men's shoes here for re sole and re heeling, both have been repaired very well. I'm quite fussy when it comes to shoe repair quality and these were great and not over priced for the quality like other places in west London. Good to find a shoe repair I can trust!! Someone said that Buckles and Brogues had shut down, well this is not true as i was there today for the first time and i was very impressed at the quality finish of mine and my husbands shoes. This shop had been recommended to me by a lot of my friends who said i would not be disappointed with the service. I have tried a few show repairs and not been satisfied with the quality and standard of my repairs. Excellent service and first class work. Very extensive range of products.